According to the local newspaper it is National Night Out and there are pictures on their website to prove it. Not on my block, however. Heard police sirens stop close by and then heard someone on a loud speaker from the block behind me. Then a friend sent this from his front porch. He lives just around the corner. My friend sent a bunch more pictures that I'm not posting. 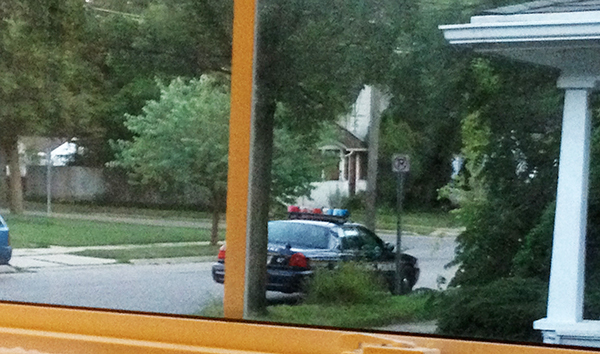 From my front window -- there is at least one more cop car over here. 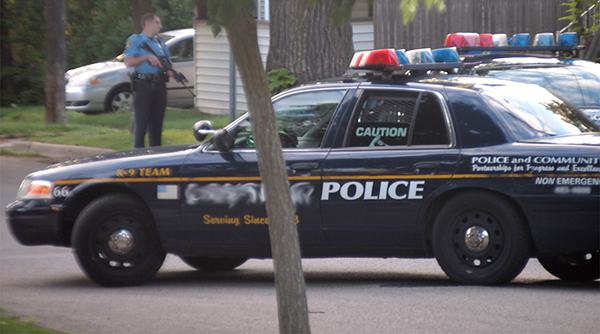 Which is better, no cops with guns, because there are a lot of cops with a lot of guns. The local fish wrapper says that the area is closed to traffic but gives no reason. Seems someone is being really stupid. They stopped my neighbor from going that way as she was walking her dog. We don't need this sort of excitement in our quiet neighborhood. About twenty years ago we had a drunk with a gun being stupid, he lived about three doors down. My previous cleaning lady's then boy friend.